"I love you everything burrito"
Despite the universal praise for the main cartoon, Adventure Time hasn’t been able to truly gain the love of the public in the gaming vein. 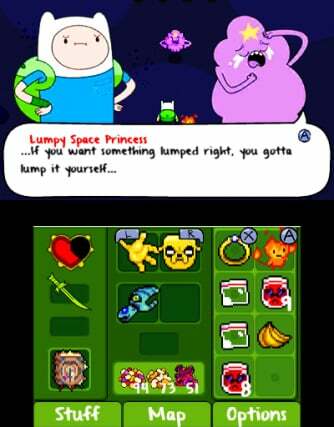 Its first stab on a Nintendo system was the snappily-titled Adventure Time: Hey Ice King! Why’d You Steal Our Garbage?! and played very similarly to Zelda 2: The Adventure of Link. The second attempt was panned by critics and fans and bore the equally memorable name of Adventure Time: Explore the Dungeon Because I DON’T KNOW!. 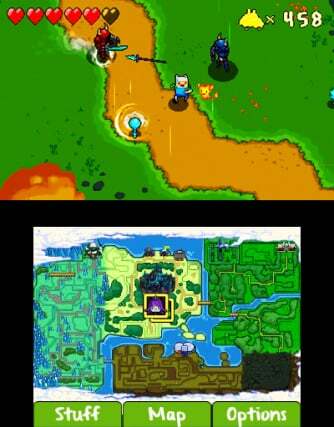 WayForward is persistent, however, but does its third title – Adventure Time: The Secret of the Nameless Kingdom – fare any better? Anyone who’s played a top-down game from The Legend of Zelda series will immediately recognise many of the tropes found in this game; to say that this title has been inspired by A Link to the Past is a gross understatement. It’s certainly not as long as most Zelda games, but considering it’s not a full-priced game you get plenty of content for your cash. You play as both Finn and Jake in a Banjo-Kazsooie-esque manner much in the same way as in the first Adventure Time game, although Jake takes a noticeably small role this time; Finn mainly relies on his Grass Sword to tackle his foes. The iconic yellow dog does have more of a role as you progress through the game, but he feels much more like a series of items than a character whilst playing. 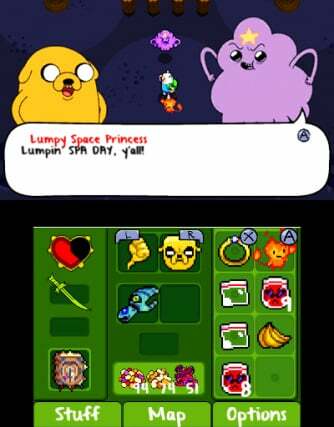 Luckily the cutscenes in the game appear to have been handled by those responsible for the cartoon, as despite their largely static nature the dialogue feels as though it could easily have been part of an episode of the show. Speaking of dialogue, most of the cast from the cartoon lend their voices for the appropriate characters, which is an incredibly important aspect whenever these tie-in games are concerned. Strangely, though, some of the characters seem to be voiced by other voice actors, such as Tree Trunks. It’s fairly noticeable but given that these characters don’t have too many lines of speech it’s not really an issue. The rest of the game manages to accurately emulate the charm of the programme, which will surely be a big relief for any die-hard fans who are thinking of adding this game to their collection. Though this plays — as mentioned above — almost exactly like a game in The Legend of Zelda franchise, there are some interesting tweaks here and there. Yes, you run around an overworld solving puzzles so you can enter a dungeon in order to ultimately battle a final boss, but the item system is somewhat different in parts. You’ll get items such as a banana that functions like a boomerang, but a lot of the time you’ll instead be awarded with a new technique for Jake to use to help better equip you against the challenges you’re faced with. Challenge is a key word here, as this game doesn’t hold your hand through anything, and is at times downright brutal with its obtuse puzzles. You’ll be able to find a few hints about roughly what it is you need to do, but you’re going to have to really think outside the box on this one. Healing items are also fairly uncommon, and many enemies have to be taken out in unique ways; you’ll have to work out what these ways are yourself. One example is the Earclops, which can only be killed by throwing a dynamite-like enemy into its earhole. If you miss, though, the explosion will stun them due to their sensitivity to sound, and it’s little touches like this make the game not only difficult, but also an awful lot of fun when you discover them. The overall presentation of the title is somewhat questionable. The characters and enemies all look and animate beautifully for the most part, but there are a number of ugly blemishes that stop this game from feeling like a complete experience. Most of the assets are based off Explore the Dungeon Because I DON’T KNOW!, but they look good, so that’s not a problem. What is a problem is that sometimes the ground’s 3D image will sometimes split, giving a window to the endless nothingness below. The menus and other elements such as the item icons are also rather lacklustre and generally feel unfinished. It’s a real shame as the game itself is an enjoyable experience, but it feels like certain parts were rushed or just didn’t have as much care put into them. 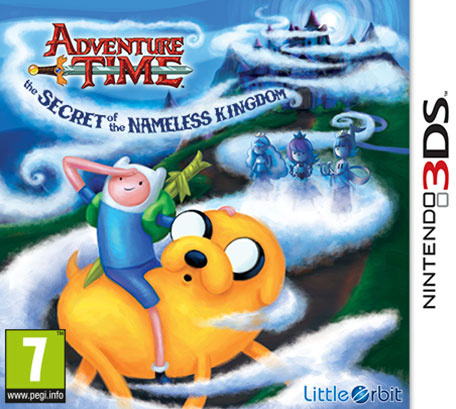 Adventure Time: The Secret of the Nameless Kingdom is a highly enjoyable experience and is definitely the strongest game in the series to date. It suffers from a distinct lack of polish and is perhaps too challenging for younger players, but is on the whole a good choice for any fan of Adventure Time. It’s also a budget title, meaning that despite its moderately short length it’s well worth the money. Pick it up for a fan this Christmas, they’re bound to enjoy its charms and well-rounded gameplay. I'm always up for some Zelda-like action, so I'll check this out. Eventually. Damn you, neverending backlog. Dang, WayForward keeps getting cursed for being rushed with licensed products. This isn't truly evident in this review thank goodness. But it is something to note about. Huh...not as bad as expected...I may pick up. This game is brilliant. I bought it on a whim in ASDA and didn't regret it. Highly recommended to any Zelda or Adventure Time fan. If you're a fan of both this is a must-purchase. Hmm... I do love Adventure Time and Zelda so I may pick this up. I just hope that it's better than ETDBIDK. 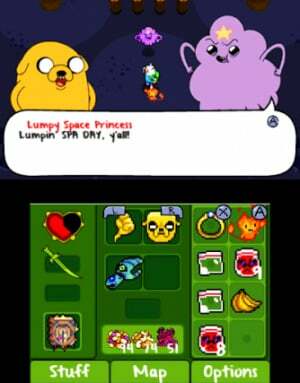 A little off topic, but I was wondering if the Wii U version of Adventure Time Let's Explore the Dungeon Because I Don't Know was any good. It reminded me of classic Guantlet games, I just didn't know if it was fun to go through with a friend despite the bad reviews. On topic, I'm definitely going to pick this one up. Hey Ice King was a blast to play, so I can see myself having fun with this. @Samuel-Flutter I'm in the minirity of people as I actually enjoyed ETDBIDK a fair amount. It's not my favourite game by any means, but I had a lot of fun with it. I played the Xbox 360 version from start to finish with a friend of mine, and let me tell you, it's so much better as a multiplayer game. One of the things many critics slammed was that it was too easy, but once you get to the later levels (and unlock the Nightosphere) it's actually one hell of a challenge. I'd say pick it up if you can find it for less than £20/$30, but only if you have someone else to play with who's also a big AT fan. @ricklongo Thanks. Now my brain is singing "Neverending Backlog" to the tune of "Neverending Story" to me. @Captain_Toad Ducktales Remastered and Contra 4 are both testaments that wayforward can do wonders with the right licence. This show never really stuck to me but it's nice to see that this time there is some real adventure to be had. I really liked the first game in the series so I'll jump on this one too! I wish they would discount Hey ice king on the eshop. I really liked the demo but $20 is not worth it for me. From the screen shots this game looks like a step back visually from the first game. Maybe somewhere down the line I'll pick it up on sale but I think I'd rather play through the Zelda handheld games I haven't played yet first. I will buy this game to replace "Explore The Dungeon" on my collector set.